Today we are interviewing Timothy D. McLendon, author of the young adult fantasy novel Last Hero. I’ve written stories with supernatural undertones since I was in the fifth grade. My background is in suspense, but I’ve found new meaning as a fantasy author. I’ve always had an overwhelming need to communicate with the world and entertain it through written words. A teenage boy discovers that his heritage is much different than everyone else’s. Olympus has been destroyed by monsters, all of the gods are dead, and he is the last descendant of Zeus. He is the only one who can save the world from the monsters of Greek mythology. What inspired you to write a middle grade / young adult fantasy? I sat down one day last year and had a vision of a teenage boy in a school cafeteria who could see monsters that no one else could, and had to defeat them or the world would be destroyed. The monsters of Greek mythology were a natural fit, as I remembered them from books when I was in middle school. Although protagonist Danny Neumann is the son of two demigods, he is still, for the most part, an ordinary guy. What did you do to make it so readers could relate to Danny? Danny is in love with the girl he grew up with, but he can’t have her. His best friend has claimed Danny’s love interest as his own, and now has nothing to do with Danny because he’s popular. Danny doesn’t feel like he belongs anymore, but won’t give up finding his meaning in life. Who do you think will enjoy your book the most? This book was written with a Young Adult and Middle Grade audience in mind. 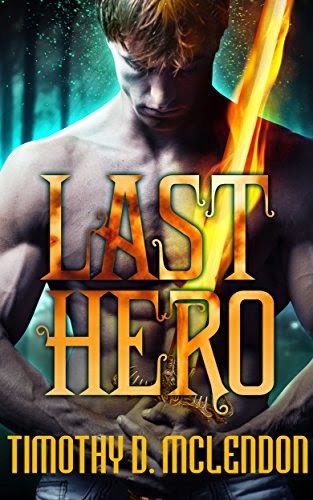 Those who enjoy fantasy and Greek mythology will enjoy Last Hero the most. Have you always been interested in Greek mythology or is something that developed recently? I’ve always been interested in the supernatural. Since monsters are in integral part of Last Hero, Greek mythology is the perfect outlet to show what Danny is capable of. I wanted to create a world that is normal for all of us, but much different than how we perceive it. Last Hero will continue to part 2. I don’t want to give away too much, but Danny’s parents are in terrible danger. There are more monsters that Danny must face. Anything else you’d like to tell potential readers? I wrote Last Hero in hopes of showing readers, through Danny’s actions, that everyone can accomplish whatever they put their minds to. Our lives may be turned upside down and rearranged one day, but we are the only ones who can decide how we react to it and fight back. Never give up hope.